n står for nøytroner - hvor mange man har. Først, på den venstre siden av er lik-tegnet står det n(t) (som man leser som n av t), som betyr at antall nøytroner kan komme til å forandre seg når tiden går - så det er altså ikke like mange nøytroner hele tiden. På høyre siden står det \(n_0\) (som man leser som n null), som betyr så mange nøytroner man har liksom til å begynne med. k er kritikalitetsverdien til reaktoren, som var den jeg snakket om i forrige formelfredag. t er tid, og måles i sekunder (tid måles alltid i sekunder i fysikk-formler - som jeg nevnte i s=vt-innlegget). Men, hvis det er en bitte liten endring, feks at k blir 1.001 istedetfor 1 - hva kan det egentlig ha å si? Nå skal jeg bare tømme (det nesten tomme) vinglasset mitt, så er det kvelden på meg her i alle fall. Siden jeg skal forelese klokken 8 i morgen så holder det ikke bare å faktisk være oppe og på plass - jeg bør liksom være uthvilt og på i tillegg...hashtag foreleserliv, liksom. 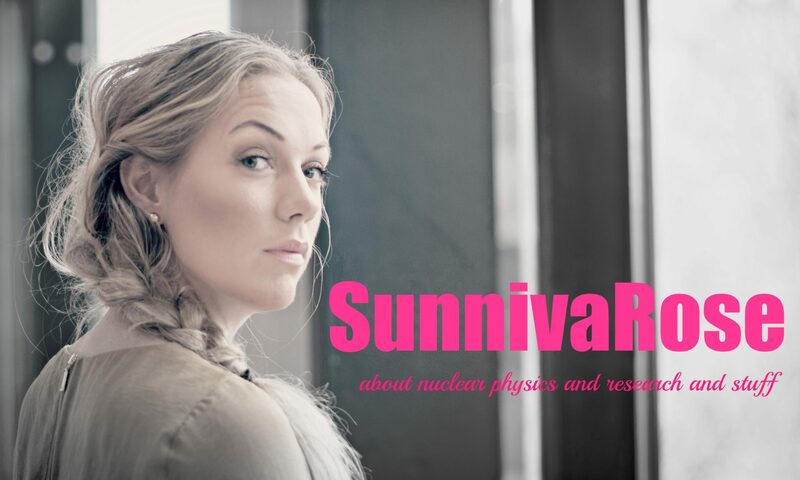 Forfatter SunnivaPublisert 10. mai 2016 2 kommentarer til When can we say that a nuclear power plant is safe? "Is it possible to conclude that a nuclear power plant is safe and, if it is, what are the conditions which make this conclusion possible? The answer to the first question is: 'Yes, it is possible'. working conditions for plant operators are conducive to solving problems, and the psychological atmosphere in the plant is marked by alacrity and by serenity at the same time"
When all of these nine criteria are met (I shortened some of them, so in the original text they are more comprehensive), then you can claim that a nuclear power plant is safe. Was Chernobyl "safe"? NO, NOT AT ALL! I know for sure that Chernobyl broke the conditions, and definitely could not be concluded to be a "safe" plant. It's not like they din't foresee tsunamis on the coast of Japan, but they didn't expect them to be as big. So what if they had foreseen a 14 meter tsunami, and they were protected against that, but then a 15 meter tsunami hit them instead? Nothing is ever (100%) safe, and at some point you have to say this is as safe as it gets. Remember: it's always a piece of cake to say after something's happened that they should have done it differently...! But was Fukushima as safe as it gets? Maybe not. Maybe the plant site (point 2) wasn't 100% ideal, maybe the plant didn't have sufficient reserve of electric power (point 8). Can we then conclude that nuclear power isn't safe at all? No. Publisert 10. mai 2016 Kategorier kjernekraft, kjernekraft: ulykker, Uncategorized2 kommentarer til When can we say that a nuclear power plant is safe? Since it was 30 years since the Chernobyl accident on Tuesday, I was thinking it would be a good idea with 10 facts related to that as a little "comeback" of Friday Facts (so sorry that I don't manage to make these facts every week, it's just that lately I've either been travelling, or really busy with my PhD, which I sort of have to prioritize sometimes 😉 ). Or, not just ten facts, but ten differences between the Chernobyl type RBMK reactor ("reaktor bolshoy moshchnosty kanalny", meaning high-power channel reactor), and the standard pressurized water reactor (PWR). 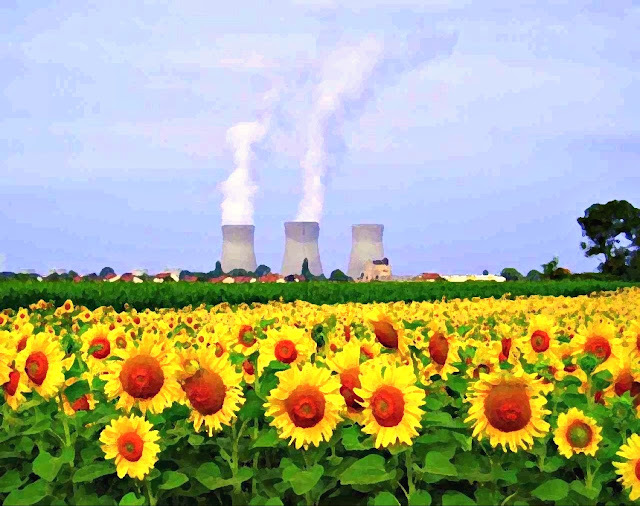 PWR is the most common type of reactor in the world operated in countries like USA, Belgium, Brazil, China, Finland, France, Germany, India, Japan (the Fuksuhima reactor was not a PWR, though), Russia, Spain, and Sweden, and several more. The RBMK was a Soviet develloped design - only built in the former Soviet Union. the PWR uses water as both moderator (for slowing down all the neutrons from really high energies, to really low energy - which is what we want <3 ) and as cooling medium, but the RBMK uses graphite as moderator, and water as cooling medium. Normally we say that the PWR is light water (light water is what we normally just call "water", instead of heavy water) moderated and cooled, and the RBMK is graphite moderated and light water cooled. These are just the first ten big differences I could think of, but there are even more. When I, or other nuclear scientists, say that Chernobyl could never happen in a modern, Western reactor, it's not because we just don't want to see reality or something silly like that, but it's because of these facts listet above - which makes that accident physically impossible in, for example a PWR...! PS: There are still some RBMKs operating in the world today, but major modifications have been made to these reactors. På tirsdag var jeg og snakket jeg for NFFJ (norske forskningsjournalister), på deres årsmøte. Det var veldig hyggelig å bli invitert, og å snakke om mitt forhold til forskningsformidling; hvorfor jeg velger å bruke så mye tid på det, til tross for at jeg vet at det på mange måter er "å skyte meg selv i foten" dersom jeg ønsker å fortsette med forskning i akademia (mitt døgn har heller ikke mer enn 24 timer, og hvis jeg bruker en stor andel av den tilgjengelige tiden på noe som ikke er forskning blir det naturlig nok mindre tid til forskning, og dermed mindre forskning på CVen min, som er den som vil avgjøre skjebnen i akademia 😛 ), og hvordan jeg gjør det (rosablogg om kjernefysikk og forksning og sånn er liksom ikke helt standard). I denne sammenhengen fortalte jeg selvsagt "historien" bak bloggen. I den historien spiller Fukushima-ulykken en stor rolle, siden det var da jeg for første gang virkelig ble kastet inn i det å være en fagperson som kunne noe om et tema som plutselig ble veldig aktuelt. For 3 år siden skrev jeg en kronikk i Aftenposten om det jeg mener var et strålehysteri angående Fukushima, og siden det var 5 år siden ulykken forrige fredag har jeg lyst til å dele teksten min her - den gjelder fremdeles, og jeg er stolt av den. Jeg skulle virkelig ønske jeg fikk tid til å gjøre mer av denne typen formidling, men nå om dagen brukes tiden på phd, blogg, og foredrag (og noen ganger radio) - håper veldig at jeg skal få skrevet mer i feks Aftenposten når jeg bare blir ferdig med denne avhandlingen min! "ATOM" er skrevet i krigstyper på forsiden av avisene – komplett tabloid med radioaktivitetstegnet inne i O-en. Det skrives nesten ikke om alle menneskene som er døde eller savnet etter jordskjelvet og tsunamien. Bryr ikke folk seg om alle menneskene som lider etter naturkatastrofen? Eller vet de ikke bedre? Tror de at problemene ved Fukushima-kraftverket er det verste som kan skje, ikke bare for den japanske befolkningen, men for hele verden?Jeg forsøker å følge med i det jeg anser som "pålitelige" kilder, som det internasjonale atomenergibyrået, men det er vanskelig, for jeg blir bombardert av svada fra så å si alle medier, fra alle kanter. I have to start this day with a blogpost I started on Friday, but unfortunately didn't have time to finish...:/ Friday was March 11 - marking the five year anniversary of the Fukushima accident. The Fukushima NPP reacted exactly as it was supposed to during an earthquake: the control-rods went into the reactor and shut it all down (stopped all the fission reactions in the fuel) - it was actually what you could call a "flawless automatic shutdown"
When a reactor is shut down, with all the control- and scram-rods inside it, it can't start again - so there is no (and it wasn't) danger for a chain reaction out of control (which is what happened in Chernobyl - an accident extremely different from this accident), but you still have all the fuel, which is radioactive, inside the reactor and this needs to be cooled. Even though the chain reaction has stopped, and heat caused by radioactivity isn't a big factor compared the hat that actually comes from fission (around 10% of the total), it's still more than enough that it will be extremely hot if it isn't continuously cooled properly. 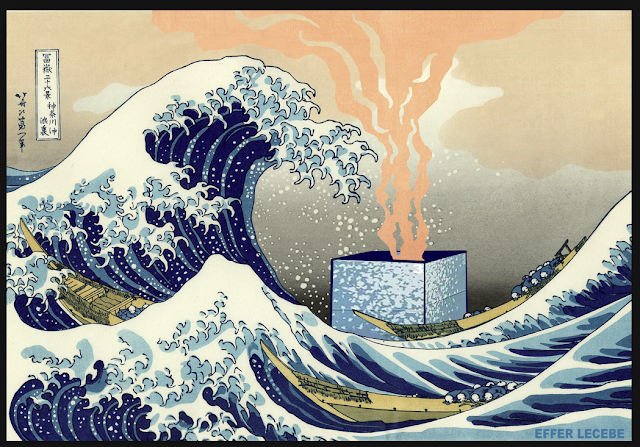 To cool something you need a medium that can carry away the heat, like water, and you need that medium/water to flow. After the earthquake and the shutdown of the reactor, this wasn't a problem, since there were diesel generators that came online and operated the coolant pumps - so that water was flowing and cooling and doing it's job. So part one of the triple catastrophe was the earthquake (and it killed a lot of people), but then the tsunami came (and it killed a lot of people), as part number two, and it immediately caused part three of the accident; wiping out the diesel generators. After this there were only some backup batteries, but they didn't last for long, and then there were no more cooling pumps, and in my opinion this is when the real problem at Fukushima started. No pumps = no flow of cooling medium/water = no cooling anymore = fuel rods heat. In nuclear engineering language this is called a loss-of-flow accident (short: LOFA), a little bit similar to the accident at Three Mile Island in 1979. Since the fuel rods are radioactive they produce heat, and since there are no cooling, they become extremely hot; and if the water then comes in contact with the zirconium cladding of the fuel (which it did), free hydrogen is produced from the water (there is a lot of hydrogen in water). Hydrogen is an explosive gas, and when it came out of the reactor tank it exploded. Such an explosion is definitely not a good sign, but I believe it looks even worse for some than it actually was... This was NOT a nuclear explosion. What blew up was NOT the reactor tank, but the building around it. Since it became so hot inside the reactor, the fuel melted (which is what we call a melt-down), and then radioactive materials were released from the inside of the fuel to the water (normally, there are no radioactive materials in the cooling water that flows around the fuel rods). No one died of radiation from Fukushima. I realise it's impossible to only give 10 facts about this accident, and I will continue very soon (Friday perhaps....? 😉 ). Uansett: for det første så var det ikke Oslo som fikk noe særlig av det nedfallet i april 1986 (det regnet ned mest over Nord-Trøndelag, Oppland og Hedmark), og for det andre så er det allikevel snakk om SMÅ mengder. Med den kunnskapen jeg har ville det faktisk ikke en gang falle med inn å tenke på at jeg ikke skulle spise rimsopp (eller at jeg måtte passe meg, og spise små mengder av det) selv om den var plukket på i Nord-Trøndelag, eller hvor det nå regnet ned mest cesium. Jeg var helt utkjørt i går, og vi sovnet faktisk sammen i sengen min, før klokken åtte - haha - men resultatet er selvsagt at jeg spratt opp klokken 5 i dag - 100% uthvilt - og dermed kunne jeg starte dagen superrolig, med en stor kopp te og titting på noen av bildene fra Japan. I dag ble det rolig morgen i hagen hos mamma, før vi satte nesen om Charlotte og Andres og deres søte Kristiane i Lillestrøm - det har blitt mer is, latte barbeinte barneføtter, barnelatter og SOL. Nå sitter jeg omsider i sofaen hjemme i Rose-slottet, med nyvasket hår og Mange tanker rundt den kommende uken; det var på et vis først i dag det virkelig gikk opp for meg at jeg er i Japan om bare noen dager - herregud som jeg gleder meg! Tsjernobylreaktoren var en såkalt RBMK-reaktor (RBMK er et russisk akronym som betyr noe sånt som "grafittmoderert trykkvannsreaktor"): den var veldig økonomisk mtp uranressurser, og den egnet seg til å produsere våpenplutonium. Vi befinner oss altså i det som i dag er Ukraina, da Sovjetunionen. Det flotte Tsjernobylanlegget har fått en ny sikkerhetsinstallasjon, som må testes ut, og dette skal skje tidlig om morgenen, lørdag den 26. april 1986. Forberedelsene til testen begynte rett etter midnatt den 25. april 1986. Arbeiderene begynner sakte og forsiktig å redusere effekten på kraftverket, den skal gå fra 3200 MegaWatt (MW) til 700 MW. Klokken 14:00: KievEnergo ber om at effekten ikke reduseres mer enn den allerhede er, siden elektrisitetsbehovet i Kiev er stort rett før helgen. Klokken 23:00: Effektreduksjonen tas opp igjen. 9 timer som skulle ha vært brukt til å redusere effekten sakte og forsiktig var dermed tapt, og siden testen skulle gjennomføres om morgenen lørdag 26. april måtte den videre jobbingen foregå i høyere tempo. Et plutselig, voldsomt effektfall på reaktoren, ned til 30 MW (mao: 670 MW lavere enn de skulle totalt). En så lav effekt gir et så lavt trykk at rør som skal være fylt med damp, heller blir rør fylt med vann. Dette fører også til at effekten gjerne faller enda mer, og operatørene jobber dermed på spreng for å få hevet effekten nok til at den planlagte sikkerhetstesten skal kunne gjennomføres dagen etter. Klokken 01:15: Reaktoringeniøren mener at testen bør avbrytes, men fortsetter å gjøre alt han kan for å få hevet effekten til riktig nivå, i frykt for å miste jobben... For å klare dette bryter han flere sikkerhetsregler. Viktigst av alt er at alle kontrollstaver dras helt ut av reaktorkjernen (ikke tillatt i følge sikkerhetsreglene), og dette gjorde at effekten hoppet opp til 200 MW (nesten alle kanaler er fylt med vann, og alle kontrollstaver er dratt ut av kjernen...). RBMK-reaktoren er maksimalt ustabil under disse forholdene (dette var kjent, og en britisk sikkerhetsrapport fra mars 1986 konkluderte med at RBMK aldri ville kunne leve opp til vestens sikkerhetskrav, selv om det var en teknologisk veldig interessant konstruksjon). Klokken 01:23:40: En operatør trykker på SCRAM-knappen og alle kontrollstavene settes inn i reaktorkjernen. Dette var dråpen som fikk begeret til renne over; effekten i reaktoren økte voldsomt fordi den nederste delen av kontroll/SCRAM-stavene var av grafitt (noe som økerreaktiviteten!). I kortversjon førte dette til to voldsomme dampeksplosjoner(rørene som opprinnelig var fylt med vann ble på altfor kort tid igjen fylt med damp, og damp tar som kjent mer plass enn vann), som blåste taket av reaktortanken, slik at reaktorkjernen ble liggende helt åpen, og deler av det superaktive brenselet ble slynget ut på bakken. Grafitten i reaktoren tok så fyr; en kraftig brann som varte i flere dager, og på en effektiv måte spredte innholdet (bla. de svært radioaktive fisjonsproduktene) ut av reaktoren og opp i atmosfæren. Den desidert verste ulykken i kjernekraftens historie var et faktum.